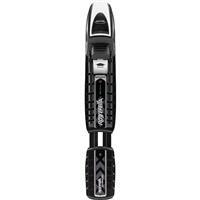 The BC Auto is an easy-to-use, traditional screw-mount backcountry binding for off-trail skiers. The easy, hands-free click-in/click-out design provides fast, user-friendly entry and exit. The BC Auto features an extra-wide 56mm steering plate for increased stability in variable snow and 40-shore flexbit.